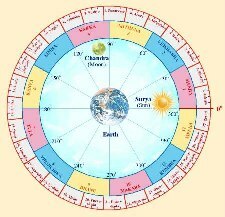 Moola Nakshatra: Spread from 0: to 13:20' Dhanu Rashi, Lord is Jupiter (Guru). Symbol - a bunch of roots tied together, deity 'Nirithi' or 'Alakshmi'. It also means the 'opposite' or 'reverse'. Moola is not one of the good stars which is evident from this that the deity is Alakshmi i.e. God of ill luck. Moola signifies roots, that is to say, everything of basic nature, its motion is finite and limited. He has a very sweet nature and is a peace loving person. He has a set principle in his life. There is a certain misconception about the people born under Moola Nakshatra, but it isn't always like that. He can stand against any adverse tidal wave. He has the capacity to penetrate that wave and reach the destination. He is not bothered about tomorrow nor is he very serious about his own matters. He keeps all the happenings in the hands of god and becomes a prey to optimism. He does not maintain a balance in receipt and payment resulting in debt. He is the kind of individual who renders advice to others, but is not capable of applying the same principles on his own self. This peculiar characteristic generally fits him for taking up the profession of financial or religious advisor. Since he is skilled in several fields there will be frequent changes of profession or trade, but stability in this direction seems to be a very rare phenomenon. Because of this inherent quality of frequent changes he is always in need of money. Moola born has a peculiar characteristic of mixing with his friends. It is quite natural that when expenditure is more than income and the native is not ready to earn anything by illegal mode the balance will always be in the negative. Hence, it is advisable that he must avoid such friends who add to his expenditure. He believes that all that is taking place on the earth is due to the blessings of God, he should also try to be a little selfish and find a way to improve the inflow of income. Out of all the 28 Nakshatras, I have come to a conclusion that these are the people who devote their entire energy with utmost sincerity to their employers as also to anyone who entrusts their faith in Moola born. A deep study of the life history of these people has revealed some facts about their separate entity as compared to other Nakshatra born i.e. some sort of internal force or some external force is guiding the natives in all the work they undertake. He earns his livelihood in a foreign place. It is advisable that he must, as far as possible, try to get an opportunity either in the professional field or in the business field in a foreign land or country as he cannot have good luck in the native place; whereas he can have much better success in a foreign land. As already mentioned above, he is capable of shining in all walks of life, particularly in the field of fine arts, as a writer and in the social work sphere. i have a pearl silver ring worn on shiv jayanthi yesterday 10/3/2013 on saturday evening of weight 4.080 carat on my right hand small finger will it benefit me & how? because the day was amavas please reply me as soon as possible! What gemstone would you recommend to someone with Moola Nakshatra?